Portuguese designer Susana Soares has demonstrated the potential for honey bees to be used in early stage cancer detection – and more. As if we didn’t already have enough to thank bees for…. Early detection is mission critical to saving lives from cancer as the chances of turning it around are often greater if it is discovered sooner. Regular health checks and screening are essential but could this project by Soares become a new tool in the fight against the world’s worst disease? Lets hope so. 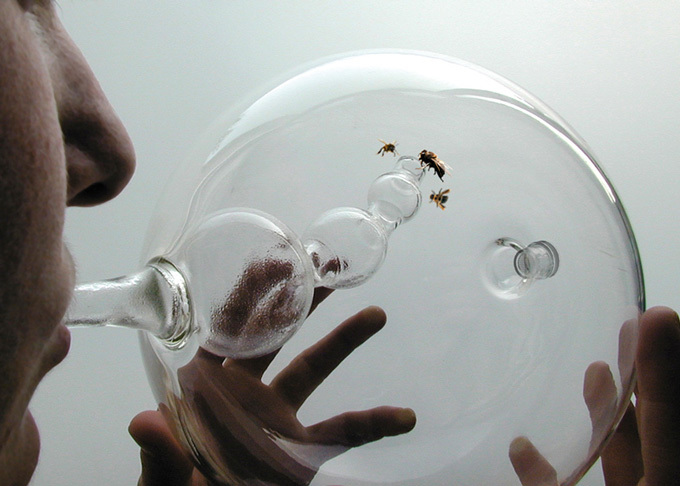 Bees have an odor perception that is on a level of acuity many leagues beyond ours, with their being able to detect infinitesimal quantities of certain molecules. Their odor perception is even more acute than sniffer dogs and is reported to be in the parts per trillion range! The glass objects have two enclosures (as pictured): a smaller chamber that serves as the diagnosis space and a bigger chamber where previously trained bees are kept for the short period of time necessary for them to detect general health. People exhale into the smaller chamber and the bees rush into it if they detect on the breath the odour that they where trained to target. The fact that we cannot live without bees might just have become more true than ever before. They have such astonishing gifts for us. Isn’t nature incredible?